Ready for more incredible patten for children?.. in this post we will learn how a crochet piece of an amazing baby that is in blanket. It is always good to be doing different patterns to learn more things, more dots and patterns of different types, from the most common to the most complex. We should always diversify so that we do not go without practice on other things, we should interleave for example, make a blanket, then make a baby dress, then a shawl, a rug, a pillow case, then a quilt finally, go mixing to practice in all. We can not forget new tutorials. Here on our site there is always something new for you. There is a lot of diversity for you, we have patterns of all kinds, enjoy it and have a look at everyone. I always receive requests for custom patterns as well as the ones we can change to give as gifts to some mom or dad. The theme of today's pattern is elephants. If you also like that sort of pattern, just keep reading that let the pattern, I hope you enjoy, separate the materials and good work. This pattern is known as Blanket Elephant Square, it's a kind of Crochet Baby Blanket with Elephant Square, it's a very adorable cover and fun to make, looking like a work of art! We can do of different colors, an example is the photo that I left of inspiration of a way of doing that is with the color of the blanket in red, that was very beautiful and gave a contrast in the elephant that was a fantastic result. You will love doing this pattern. I myself loved this blanket because I am in love with baby things and also with animals, and in this pattern joined both. If your baby loves animals too, I'm sure he'll love that blanket he will not want to drop any more. A great choice also to decorate his bedroom and his crib with these lovely designs would be a perfect crochet option. 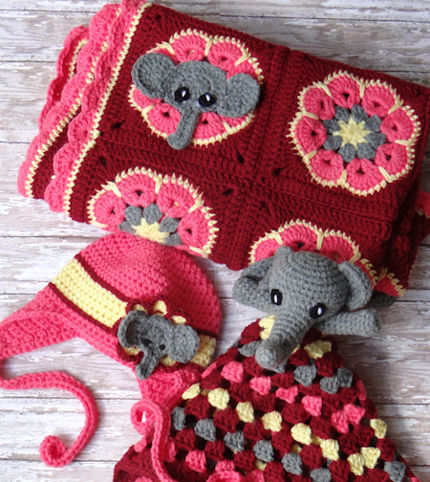 This pattern is composed of squares with elephant appliqués made of crochet along with plain squares of the blanket. I found it beautiful and very creative, mixing squares with drawing and smooth squares giving a fantastic result. Use vibrant colors or even make a pastel-colored blanket, light colors, blends with babies and becomes super cute and delicate. But nothing prevents you from making the colors you like or prefer and also if you order, ask the color that the person prefers or will want the model you have. Do not forget to always ask the customer to taste it. 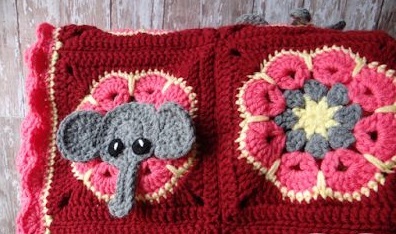 The squares that use elephant apply are 10 of each drawing for the baby blanket the size of 4x5 square. It's very easy to put together and looks great! You can lock the squares before joining them all, as they get smoother in the end result. To temrinar the blanket, you can make simple stitches and a round with spots of shells, or you can also make another that suits you best and that will match your work. Everything has to be combining. So if you liked it, just click on the name below that I left the pattern and see the step by step with all the information to make this pattern, this pattern is available as a free download !!. I hope you enjoy it because it's so cute to do. Enjoy our page on facebook Xell Crafts and stay on top of all the news and patterns you have here on our site. Good job.